Walsine Pierce: THE LOSS OF AN OLD FRIEND: A Sad Day! 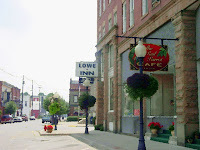 Back, maybe 15 years ago, I was coming "up river" in my Ohio River Lock Boat. I'd been on the river for about four weeks. It was October but it was in the 80's and I was suffering from heat and exposure. When my brother Henry saw me at the end of the trip, he said I looked like a piece of old leather. This was my second trip on the river since my retirement at age 60. The first trip was by paddle in an 18 foot canoe. On this trip I was using a 5HP outboard that Julie had given me for Christmas. 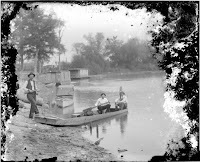 The trips were so meaningful that I would eventually make a six week trip down river in a small sail boat. As a child the Ohio River was my playground. 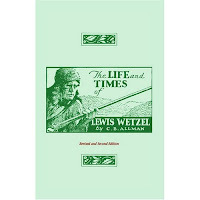 I played pioneer and indian, I was always my dream character, "Death Wind", Lewis Wetzel. The river intertained us as we watched traffic going up or down, boats and the trains that ran alongside. The Ohio River was a major source of food as my Mother ran her trot lines. I whiled away many a lazy day with a cut pole catching what ever had scales, or not. The biggest thrill of the day was swimming out to catch the waves of passing paddle boats. I have always loved the Ohio River. I was living out a Life Time Goal on this trip. Since my earliest days at the "point" of Point Pleasant, West Virginia where I'd look down stream where the Great Kanawha River enters the Ohio I'd say to myself "some day I'm going down that river". To me the "point" was almost hallowed ground. It still is. The indians called the point Tu-Endie-Wei, which meant "the mingling of two waters". 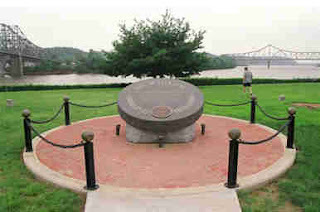 In 1939 the United States Congress decreed that it was the site of the first battle of the revolution war which took place on October 10th, 1774. But on the day described I was several days down river from Point Pleasant. Just below Ashland, Kentucky I was approaching a sandy point that was in shade. I decided I'd get off the river and cool down. When I beached my boat and jumped out I was disgusted at the sight of bottles, cans and food wrappings. Some thoughtless people had recently had a party and trashed this beautiful sight. How sad! In the trash I spotted a still new belt knife sheath. 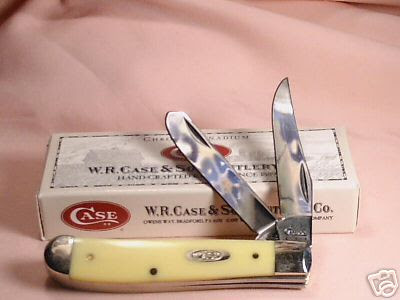 The big scrolled name of "Case" was imprinted on the front of the sheath. It had perhaps been damp from the dew but it had never been rained on. I thought "gee, I wonder if they left the knife too". Sure enough, they had. There in the sand a few feet away, laying opened, was a still shiny new, bright yellow Case pocket knife. I immediately named the knife "Old Lucky". For the next fifteen years when people would ask "you got your knife" I'd always reply, "have I got my pants on"? If I had my pants on that knive was carefully placed blades down in my right front pants pocket. It was a hefty knife with two blades. The square ended blade was for work. The pointed blade was always kept quite sharp for "emergency" use. From opening boxes to peeling potatoes and cleaning fish, "Old Lucky" was part of me. When Mark, Todd & Kimberly took me to the Army-Navy game for my 70th birthday, (Go Navy), Todd, who faithfully carries a pocket knife, said "Dad, I'm going to leave my knife at the hotel". It was a couple weeks after 9-11 and security would be tight with the president being there and all. I replied that my knife was legal and it went where I did. At the gate security did everything but strip search the fans. When I emptied my pockets the guard said "Mister, you may be going to the game but that knife isn't". I took a stroll and hid the knife until after the game, but that is another story. As I started my trip from Point Pleasant my bother Henry had cut himself with his knife. It was a small Case knife. I pulled out my Case, just like his but much larger, and told Henry he needed to get himself a real knife. "Ah", he said, "that knife probably cost a hundred dollars and is too expensive for me". When I got back to Point Pleasant, with "Old Lucky" at home in my pocket, I "sold" Henry my old knife for a penny. (It's bad luck to give a knife--it will cut the friendship). He was pleased to get the knife. He sharpened it razor sharp and used it often but he never carried it thinking it to be too big. On my aborted cross country bike trip I lost "Old Lucky". At the airport, wondering what I'd do with it on my red eye flight home, the knife was gone. I waited until my gear got home a month later and hopefully searched but the search was in vain. "Old Lucky" was gone. I have felt naked without that knife. I probably have a dozen or more knives of every description but I had got used to that big, yellow Case. Yesterday, on my trip to the farmer's market, I replaced it at the Ace Hardware in Hartville. I feel more "balanced" with a big yellow Case knife in my right front pocket again. It nearly blinds me it is so shiney new. Time and use will take care of that. "Do I have my knife"? "Do I have my pants on"? "Why do I carry a knife? Because I have one. Because I can. Because I need it.